Open Sundays May-September, 2-4 pm or anytime by appointment. 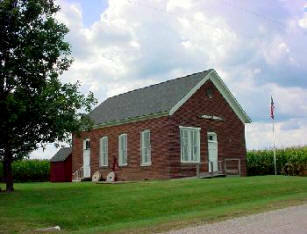 The Lincoln School Museum is a restored 1880’s one-room brick school located one mile north of Martinsville, Clark County, Illinois on a spur of the National Road. The museum is accessible from the Martinsville I-70 exit 136 for travelers to the area. Local residents need only travel York St. north to Harry Glynn Drive. It stands on the original location and has been restored to its turn of the century charm. The building now serves as a living history museum for area school students and the general public. Custom programming is available to school groups upon request. The Lincoln School is representative of the brick construction of one-room schools built during the 1880’s. 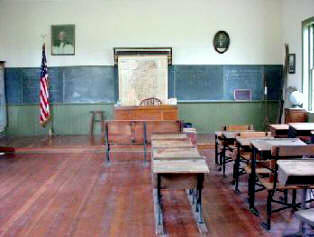 It represents the typical one-room school of the era and the education available at that time. The Lincoln School, District 3 of Martinsville Township, Clark County District 27, existed as early as 1843. The earlier wooden structure was replaced by this building erected about 1888 from soft mud brick made by Harold Gallatin, a farmer ¼ mile east. The building is done in the Italianate architectural style and mortared in an English bond. It served as a school until 1950 when all 102 one-room schools in Clark County were consolidated. For the next 36 years the building was used for storage. The preservation of the building began in 1987 when it was purchased by the Martinsville Chamber of Commerce and opened to the public in July of 1988. Lincoln School Museum interprets a one-room schoolhouse at the turn of the century. The authenticity of the restoration has been recognized by the Illinois State Historical Society and the American Association for State and Local History. It is open to the public on Sunday, 2-4 pm, May through September or anytime by appointment. The building is handicapped accessible.